I would certainly hope that readers of this blog already know and love this album, but there's always the chance that someone not familiar with Comets of Fire may stumble across this post. If I was forced to to choose only one album as my "desert island album", this would be the winner, and even though I would be lonely, starving, and bearded, I would still feel like the biggest badass when listening to it. 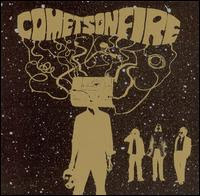 In my opinion, the psychedelic wonder that is Comets on Fire is best heard on this album. Each and every time I throw this CD into the player, I wonder why it ever left in the first place. About as highly recommended as I'll ever recommend anything.